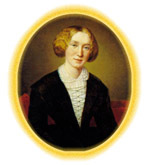 Martha Barclay (nee Jackson) was a school-fellow of George Eliot's in Coventry in the 1830's. It was Martha who initiated the choice of flower names for herself and her friend - Ivy (constancy) for herself and Clematis (mental beauty) for George Eliot. Letters from George Eliot to Martha have been published in Volume 1 of The George Eliot Letters edited by Gordon S. Haight (1954), but Martha had been pressed by John Cross to allow him to publish them in his biography. This she refused because she felt she could not trust George Eliot's widower to select satisfactorily. She planned to publish her own reminiscences but never did, possibly because Charles Lewes, G. H. Lewes's son and George Eliot's literary executor, would not give permission for her to use her precious letters.